We just added Jeremy Caplan, director of education for the Tow-Knight Center for Entrepreneurial Journalism at CUNY's Newmark Graduate School of Journalism. He’s teaching mobile newsgathering and time management. Jeremy has taught tech tools for journalism at ONA and many other events. He is one of the most tech-savvy journalists around. But he makes you think you can master the tech universe, even if you never conquered the clock on your VCR. Sign up today for just $85 while seats are still available. Also on Saturday, Ron Nixon, Washington correspondent for the NYT, is teaching data-driven enterprise. Ron is a former training director for IRE, as well as a Marine veteran. He got his start as a staff writer at a statewide, weekly, black newspaper in Columbia, S.C. 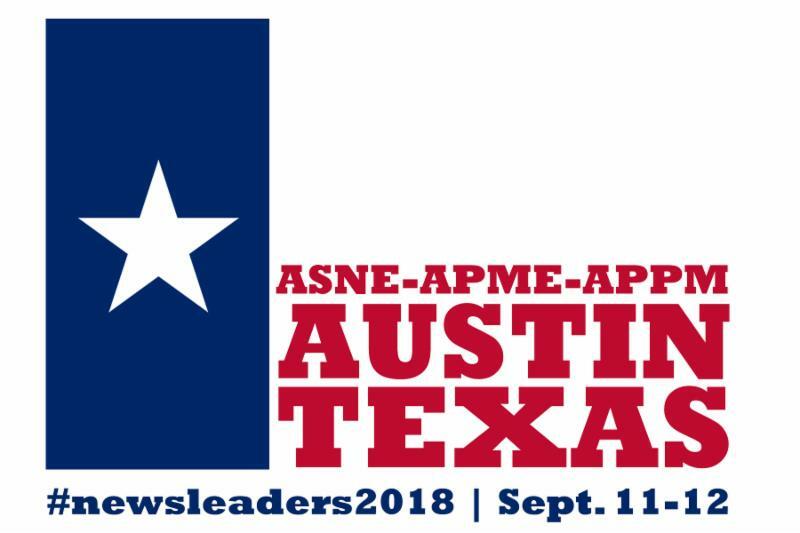 The 2018 ASNE-APME News Leadership Conference kicks off in less than a month! For two full days at the AT&T Executive Education and Conference Center, we'll address the latest innovations in content and technology, leadership strategies, new business models and more. Check out the schedule and sign up now to join us Sept. 11-12! Those who register between now and Aug. 31 can bring a colleague for only $100. Email APME program assistant Laura Sellers lsellers.newstrain@gmail.com to receive a promo code for this deal. Special rates are also available for retired members, spouses, students and APME's Regents. Lunch tickets ($40 a piece) for Tuesday, Sept. 11, and Wednesday, Sept. 12, can be purchased during registration or separately from our online store. Our discounted group rate in the ASNE-APME block at the onsite hotel at the conference center (1900 University Ave., Austin, TX 78705) has expired. The hotel might still have rooms available outside our block. You can call the hotel at 512-404-1900 and ask or check out these other hotels nearby. Click here to learn more about these companies. Improvements in transcription software technology have made this an indispensable item for newsrooms seeking to improve the efficiency of their writers and video teams. No more hours spent painfully transcribing long interviews. One of the leaders in the field, battle tested at The Washington Post among others, is Trint. Your newsroom creates thousands of pieces of valuable intellectual property each week, and publishers are moving quickly to better control and monetize it. The New York Times is partnering with a production company. POLITICO signed with ICM. McClatchy, The Washington Post, The Guardian, Daily Beast and NPR are represented by Storied Media Group in Hollywood. We'll explain the newest revenue stream and how you can capitalize on it. Philadelphia Inquirer: 165,000 Philly homeowners may be paying too much in property taxes. Is the city assessing property fairly? Sacramento Bee: In emergencies, cell phone alerts can be too slow to save lives. Can the system be fixed? ProPublica: We Are Expanding Our Local Reporting Network. Submit Your Best Project Ideas for Investigating State Government. NEW YORK (AP) - Robert J. Danzig, who overcame difficult beginnings as a foster child during the Great Depression to become the head of Hearst Newspapers, has died, the company said. He was 85. Under Danzig's leadership, Hearst acquired the Houston Chronicle, San Antonio Express-News and several community newspapers. It gained a daily circulation of more than 1.3 million and a Sunday circulation of more than 2.5 million, the company said. "Bob Danzig played a pivotal role in the dramatic growth of Hearst's newspaper operations in a career that spanned more than 50 years," Hearst President and CEO Steven R. Swartz said. "He was the rarest of executive talent, with equal measures of pragmatism and warmth, and his leadership lessons are part of Hearst's DNA."